Platforma – Free Your Hands! Background: I too ride a motorcycle and carry an iPad and a sandwich back and forth to work. I have this HUGE backpack that I’ve been using for that job and it is serious overkill. I’m also a bit of a nutter when it comes to keeping my hands free. Pockets, pockets everywhere is my motto. Strotter is a new company that currently has two products: the Platforma and the Across. The Across is more of a sleeve for an iPad and someone else will be reviewing that. The Platforma is a messenger-style bag that can hold a full-size iPad plus a few additional items. It’s not the biggest bag in the world, but then again, that’s the point. What makes the Platforma bag unique is the way it functions. It has D-rings at each corner of the bag so you can attach the strap in various configurations. Attach the strap using both rings at the top and you can wear the bag as a shoulder bag. Attach one end of the strap at the top and the other end at the opposite bottom and the bag can multitask. First, it can serve as a really snug backpack if you pull the strap tight. 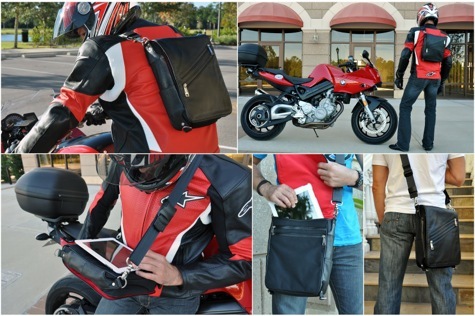 (I hesitate to wear other messenger bags on my motorcycle as they can slip off my shoulder. Not this one.) Or it can serve as platform for the iPad if you let the strap out a bit. Using the bag as a platform for the iPad (hey, it’s called Platforma for a reason) is this bag’s purpose for being. It comes with a case you snap on your iPad (that works with the Apple Smart Case) that has magnets built into the bottom. You use those magnets to attach the iPad to the exterior of the bag. Yes, I said you attach the iPad to the exterior of the bag. Not so much to carry it around, but when configured and held correctly, the bag becomes like a lap desk that you can use to read or type on your iPad. Those magnets are secure too. I’ve always been a bit skittish about reading on my iPad when I ride the bus. It’s a two handed device, so when I have to hang on for dear life, I have to let go of my precious iPad. The Platforma bag solves that problem nicely. I have much more confidence in using my iPad and not worrying about it slipping out of my hand, or even having someone grab it from me. Did I mention the magnets are strong? The bag itself is top quality. It’s a solid pebble leather that’s going to stand up to anything I can throw at it. The zippers and fasteners are apocalypse-proof, not to mention gorgeous. The strap is smooth and easy to operate, even one-handed wearing gloves. I find that the bag can hold my iPad, my Moleskine, my bus schedule, and my sandwich just fine, with room to spare if I needed to include chargers or other miscellaneous items. And it closes using magnets, so it’s pretty fuss-free to operate. This isn’t a cheap bag by any measure. But you certainly get what you pay for. The quality and functionality of this bag sets it apart. It’s a beauty built with brains—what more could you ask!